Secret bars are nothing new, of course, but very few have mastered the quirky yet elegant style of the newly opened Foxglove tucked away on Duddell Street, at the heart of the city’s Central district. 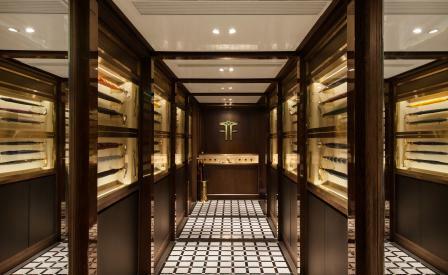 The speakeasy-style lounge bar is accessible only via an unmarked entrance hidden inside a walk through boutique of classic hand-made Fox umbrellas showcased Kingsman-secret-service-style within sleek brass-edged wall cabinets. Apart from the original cocktails (we were particularly taken with the ‘Bitter Truth’, a warming concoction of Kraken black spiced rum with Angostura bitters, orange and lime), the design highlight is the VVIP room decorated in an emerald green palette, with seductively comfortable leather club chairs, and walls and ceiling clad in book-lined shelves.